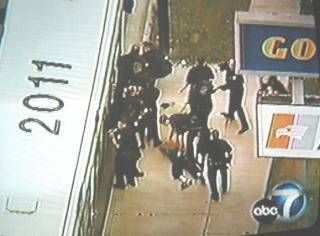 (April 21, 2003, updated 5:00 p.m.) -- LBPD successfully handled an extremely dangerous situation today, arresting a man allegedly involved in two separate shootings (one involving his girlfriend, the other with LBPD officers). The events included allegedly taking the couple's two-year old son, boarding a bus and firing at police before surrendering near Bixby Road and Cherry Ave.
LBPD says the events began at roughly 5:30 a.m. when police received a report of shots fired inside a residence in the 2200 block of East 14th St. Responding officers learned that the suspect, 22-year old Daniel James Sigler of Las Vegas, had allegedly shot at his girlfriend at the location, missing her. The suspect then fled on foot...allegedly taking the couple's two-year old son with him. Officers set up a perimeter and notified LB Transit of the suspect's description, which turned out to be a very wise move: LB Transit notified LBPD's Communications Center that the suspect and child were believed to be aboard a bus traveling north on Cherry Ave.
Police instructed the driver to pull over on Cherry Ave. north of Bixby Road...and when officers instructed the driver and passengers to exit the bus, the suspect and his child remained on board the bus. At about 7:45 a.m., shortly after the last passenger exited, the suspect allegedly fired shots at a police unit parked near the bus. Officers returned fire, although the suspect was not injured. Courtesy: ABC7 Eyewitness News ...and surrendered to officers who descended on the scene. The child suffered minor cuts on his feet, was treated at a local hospital and released to the Dept. of Children and Family Services. Police say the suspect is also wanted by Las Vegas police for a series of carjackings this past weekend. He's being held at the LB city jail on charges of attempted murder against his girlfriend and the police officers. LBPD is also working with Las Vegas Metro Police in their investigation of the carjackings. Anyone with additional information about these incidents is asked to call PBPD Homicide Detectives Richard Birdsall or Scott Lasch at (562) 570-7244.